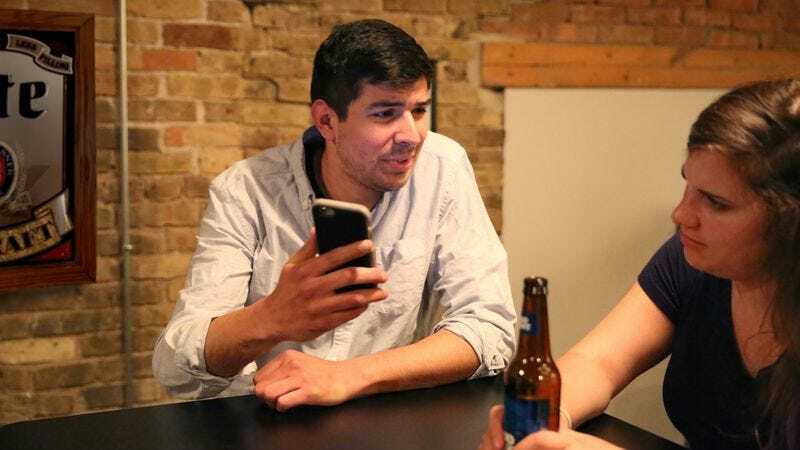 BOSTON—Reading the message aloud to several of his friends while out at a local bar Thursday night, area man Jason Schwerbein, 26, gleefully mocked a worried text from his mother as if it were the demented ramblings of a village idiot. “You guys have to hear this—my mom wrote ‘Where are you? I heard there’s going to be flooding tonight,’” said Schwerbein, laughing heartily and affecting a derisive tone of voice as though the words he was repeating were uttered by a local oaf who was kicked in the head by a mule and whose only contributions to the community were dancing for pennies in the town square and entertaining passersby with the nonsense spewing from their misshapen skull. “Then it goes ‘XOXO, hope you’re okay!’ Jesus, what does she think, I’m going to drown?” At press time, Schwerbein had resolved to respond with the phrase “I’m fine” at some point during the following day.